Homebrewing is witnessing a major evolution as craft beer becomes more endeared and brewing technology advances. Traditional homebrewing is often rather complex due to the amount of equipment needed and the time-sensitive steps involved in the brewing process. 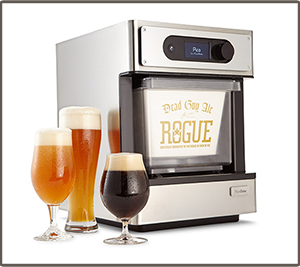 New market revolutionaries such as Picobrew, Brewie, and Brew Boss are eliminating brewing complexity by introducing auto brewing systems, which opens up a market to millions of people who may have been hesitant to the hobby. After looking into homebrewing on automated brewing systems compared to more traditional setups, you’ve decided that automated is for you. Each system has it’s own features, so it’s also important to research which system you should look to acquire. Here is a guide to several systems that covers their pros, and cons to help you make a decision. This guide covers five different automated brewing systems. The PicoBrew Pico, PicoBrew Zymatic, BrewArt BeerDroid, Brewie and the iGulu. If there is a new one on kickstarter, or a new system on the market that you would like more information on, please let us know in the comments. The PicoBrew Pico is the first of two systems from the PicoBrew brand. The PicoBrew was one of the first systems available on the market. It is the smaller of the two systems, and I’ll cover that unit in the next section. 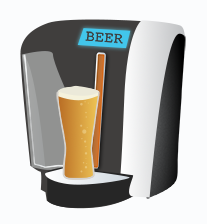 Beer is created by inserting a PicoPak into the machine and simply pressing a button. After a few weeks, your beer is ready to serve from the included mini kegs. PicoPaks are available on their website, where craft breweries from around the country have added their recipes. They are also beta testing a “Freestyle” feature where you can create your own PicoPaks. This is ideal for those already experienced in creating their own beer recipes. It also has four hop addition compartments, which can handle most hopping schedules. ✅ PROS: One of the advantages of this system is price. Pico has been around for awhile and have honed their costs down on this smaller automated brewing system. The Pico packs keep the ingredients fresh right until brew day. However some haste should be considered with any homebrewing as yeast and hops do lose viability with time. ❌ CONS: The price per batch is on the high side. Since the Pico requires a specialty packet to brew, you are tied to spending roughly $25 for 1.5 gallons of beer or $1.60 per beer. With the smaller batch size, you may end up drinking faster than your system and produce, especially if you are having a few friends over for a football game. The last on our list of automated brewing systems may not be the least, but that’s up to you. Like the iGulu, the BeerDroid is not available to ship yet, but is coming soon. The BeerDroid is actually packed with plenty of cool features despite the lower price-point. The system allows you to set temperatures for different phases of fermentation, such as propagation, fermentation, and conditioning. The system also has a storage mode, which will keep your fermented beer healthy if you aren’t ready to keg yet. Recipes appear to be available through their “Brew Prints”, which are similar to PicoPaks, but look to be more manual. ✅ PROS: There is a lot of tech packed into the BeerDroid, and it has a nice on-counter appearance. It has a decent capacity of 2.5 gallons which is middle of the typical range. ❌ CONS: The BeerDroid doesn’t actually serve your beer. You would need to keg in 3 gallon kegs yourself or bottle the beer manually. If you do want to, they will be selling a companion machine, the BeerFlo, which is capable of serving your beer without the aid of CO2. 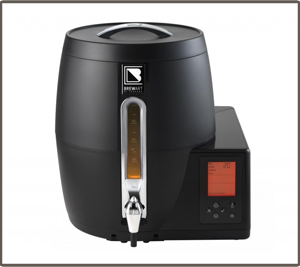 The PicoBrew Zymatic is the big brother to the “Pico” version. 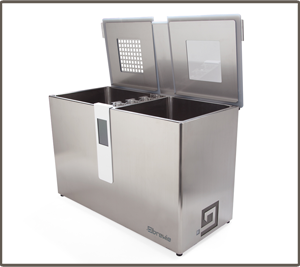 The Zymatic creates larger batch sizes than the Pico version. This equates to roughly 10 more beers per batch. This is better news for those who drink more often than casual drinkers. Beer is created by the user. It’s more hands on than the Pico version, and the user can create custom recipes and shop around for the best ingredient prices, which can bring your price per beer down close to a dollar (depending on your recipe). ✅ PROS: If you’re already a homebrewer, this is a great system. It takes the work out of your brew-day, but instead lets you control your recipes from ingredients to brewing schedule. The batch size is greater than all but a few exceptions in the automated brewing system market. ❌ CONS: The price for the unit itself is high. It is in a strange place in the market where it does require more homebrewing knowledge than some of the other systems, but a homebrewer may want to spend this on different equipment if they could. This system is ideal for new parents who homebrew. Having a child leaves a lot less time for brew days. 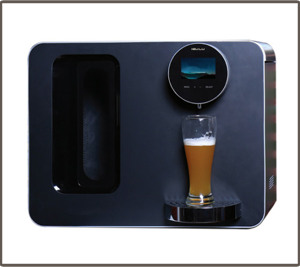 The PicoBrew Zymatic let’s you create your own beer recipes but takes the work out of brew day. It’s also a lot safer than having an open propane burner flame. The Minibrew is one of the newer systems being released via an Indiegogo campaign. It offers new features as well as some improvements over previously released automated brewing systems. It has a unique app called the Beer Compass, which helps you select the perfect beer style to brew based on your preferences for flavor, alcohol percentage and color. It also has a cooling device built into each fermenter/serving keg which allows you to ferment and serve multiple beer styles at a given time. Recipes will be available through their app once released. ✅ PROS: The MiniBrew app will allow users to monitor fermentation, and select beer styles in a new way. Purchasing extra kegs allow you to ferment and serve multiple batches at a time. Not all automated brewing systems off this. Cooling device built into each MiniBrew Keg frees up the brewing device for more batches, negating the downside of smaller batch sizes. ❌ CONS: Serving from the fermentation keg can produce sediment issues if disturbed over the life of the keg. Recipes have a lack of customization. The iGulu is one of several automated brewing systems that recently jumped into the market and is in development on IndieGoGo. The iGulu’s features closely resemble that of the PicoBrew Zymatic, as it does allow for custom recipes but does have a smaller batch size and isn’t available on the market just yet. They do have a fully funded Indiegogo campaign and are taking pre-orders. ✅ PROS: The iGulu has a sleek design and interface that has better aesthetics than some other automated brewing systems on the market. 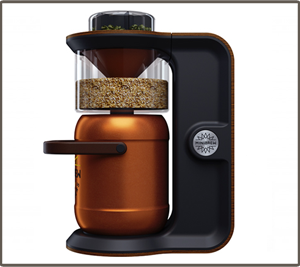 The iGulu has the customizable recipe features of the PicoBrew Zymatic, but the price point of the Pico. The tradeoff here is batch size. This system would work great as a pilot system for dedicated homebrewers. You can test recipes without as much hands on time sunk into a brew-day for a 1 gallon test batch. ❌ CONS: Since the system isn’t on the market yet, you won’t be able to get your hands on one until October 2017. The batch size is one of the smallest at only 1.25 gallons. If you drank one beer per day, the system would not be able to brew fast enough to keep up. The Brewie resembles a very small chest-freezer in shape and size. It’s 2.5 feet wide, roughly 1 foot deep, and 1.5 feet high. It’s a slightly larger footprint than other automated brewing machines, but does have the huge benefit of brewing full 5 gallon batches. Plenty to keep you and your guests drinking until the other beer is finished. In fact, a modest drinker could build quite a pipeline if they built a kegerator or keezer. The Brewie, also connects to a water supply, so you aren’t filling the system manually with a pitcher. ✅ PROS: The large batch size of 5 gallons is the homebrewer standard for many setups. Most recipes posted online are for 5 or 10 gallons, so importing recipes to the brewie is easy on that front. You get to build your own recipes, so consider it a larger batch size version of the zymatic. The Brewie has water inlets to hook up to your home’s water supply, so you don’t have to worry about manually filling the system. ❌ CONS: One of it’s Pros can also be a con. The mineral content and overall quality of your water actually plays a key role in creating near perfect beers. With the aid of these systems during fermentation, one of the only factors you can’t control with this setup is the water. The brewie system only has 4 pre-built recipes at the moment. If you aren’t into crafting your own recipes, you’ll have to do some digging. What is an Automated Brewing System? When it comes to making beer, there are a lot of ways to reach your destination, a cold homebrewed beer in your glass. There are manual processes, refined manual processes to be more automatic, ingredients that will shave ninety minutes off of your brew day, and fully automated brewing systems. There are probably as many ways to make beer, as there are styles of beer (and there are a lot of styles). So what exactly is an automated brewing system, and what makes them desirable to some brewers? There are four key ingredients that go into a beer. Water, malted barley, hops, and yeast. There is one exception to all four of these ingredients being present in your beer, but I’m not going to get into technicalities. Through the magic of chemistry and time, water activates enzymes in malted barley that convert starches into sugars, which can be later converted into alcohol by yeast. This process is called the mash. The mash should sit at a temperature between 150-153F for about an hour. Automated brewing systems will maintain this mash temperature for you. The sugary water is called wort. In most beers (again just one or two exceptions), the wort is boiled and hops are added throughout a boil lasting between 30-90 minutes. Hops do different things for the final beer depending on when they are added in the process. For every minute hops are boiling, they add more bitterness to the final beer, but also lose flavor and aroma. This is why groups of hops are added throughout the boil. Some additions are for flavor and aroma, while others are for bitterness. Automated brewing systems will handle the boil time and hop additions for you, as well as adjust the heat to prevent boil overs. Once the boil is complete, the wort is cooled down to a temperature suitable for yeast ( under 85F, but ideally 65-70F). The yeast will begin to multiply for about 24-48 hours and then begin converting sugar into alcohol and CO2. This is called fermentation. The CO2 leaves the fermentation vessel and the alcohol stays in the beer. In addition to alcohol and CO2, the yeast actually generate some heat while fermenting. This can cause off flavors in your beer if the change in temperature is too much. Automated systems typically have built in fermentation chambers to manage the fermentation temperature. After 3-5 days, all of the sugar the yeast was designed to handle (there are different yeast strains which can consume more or less sugar) will be finished fermenting. Your beer isn’t quite done yet. Ten to fifteen days after fermentation is over, the yeast works to clean up some of the byproducts created during fermentation. This is still considered part of fermentation by homebrewers, but the conversion of sugar into alcohol is already complete. After this, the beer is moved from the fermentation vessel to a serving container, usually a beer bottle or keg. Bottles need to have sugar added back in to renew fermentation in the bottle. This time the CO2 is trapped (as the bottle is closed), and this carbonates the beer. Kegs can also be conditioned this way, but can also be force carbonated by adding CO2 to the keg. Force-carbonated kegs are ready in a day or two, and bottles are ready in about a week. Some, not all, automated systems will move the beer to a serving keg, force carbonate it, and keep the keg at the ideal serving temperature. As you can see Automated brewing systems should take all or most of the work involved mashing, boiling, cooling, fermenting, and conditioning, and handle it for you. You don’t need to worry about anything except loading a recipe into the system and waiting patiently for the processes listed above to be completed by your system. Depending on the system you choose, some of the tail ends or recipe creation aspects are up to you to handle manually. 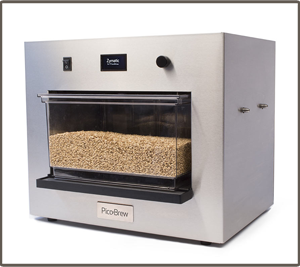 However systems like the Picobrew Pico are just a button press and 10-15 days away from serving beer. How Can I Tell if a Brewing System is Automated or Not? Automated brewing systems are typically counter-top devices. Think of them like a single-cup coffee maker on steroids. Homebrewing setups that aren’t automated typically come with a large kettle, and a lot of other miscellaneous tools. The price-point is usually a key indicator, as they are 5-10 times more expensive than the startup kits I mentioned before. However there are a couple exceptions which may trip you up. These systems listed below are NOT Automated brewing systems. The Grainfather: The grainfather is a single vessel brewing setup that automates the mashing and boiling process. But the brewer must add hops, transfer, and condition the beer themselves. The Braumeister: Similar to the grainfather, with a few different features. This is a high tech brew in a bag system. The Brew Boss: This is very close to being a fully automated system but is missing a few key components that the systems listed in our comparison article don’t have. You need to manually remove the grains from the kettle before the boil begins, and the system only is automated up the point where you need to cool the beer. This should give you a good understanding of what automated brewing systems are. Once you’ve decided that an automated brewing system is right for you, it can get tricky when choosing which system is best. Not all of the systems are created equally and have different features. That’s okay, especially if you already know which features you want in your system. Let’s look at some of the available features to look out for when shopping for an automated brewing system. Recipes: Some automated systems require you to purchase special recipes from their store, or authorized vendor. Before making a final decision on an automated brewing system, look to see if you must purchase their recipes to brew a batch of beer. If so, make sure they have a wide variety for you to choose from. The benefit here is that you don’t have to worry about recipe creation, but if the company ever went under, your system would be useless unless they released an update of some kind before doing so. On the flip-side. If you’re interested in brewing your own recipes, make sure the option is available to you. The last thing you want is to be tied to make pre-made recipes when you want to create your own from scratch. Water Hookup: Some automated brewing systems have water hookups directly to the system. This would be the most automated feature of all available systems, as it draws water for you instead of having to manually fill a reservoir. This feature can serve as a huge benefit or hurting point depending on the quality of your tap water. Since water is drawn into the system automatically, you’re not able to remove chlorine or adjust the mineral content, which are both critical to making award winning homebrew. In fact, without those things, your can taste flat, minerally, or taste like band-aids or cherry medicine. Not good. So if your tap water isn’t ideal for brewing, you may want to avoid water hookups. Batch Size: How much do you drink? Generally one gallon will be worth about 9-10 beers. The turnaround time for a typical beer is 2-3 weeks (or 14-21 days). If you drank one beer per day, a 5 liter batch wouldn’t produce enough beer before it’s finished brewing another turn. Figure out how much you’d like drink beer made from your system. Batch size for automated brewing systems runs from one to five gallons. Serving Method: How your beer gets served leaves another choice for you when shopping for an automated brewing system. Some require to you bottle, or move to a kegerator manually, while others transfer your finished beer to the serving vessel automatically. The benefit of having a separate kegerator is that you can brew a new batch while you drink the previous one. Systems with everything attached means you can’t brew more until you’re finished drinking the previous batch. Software or App: Many of the systems available feature some kind of software or app to go along with it. Compare and contrast what each app offers as far as features go. Some let you control the brew, and others let you track fermentation process. Each app is tailored to their specific system, and will have a custom interface. If you’re into the tech side of brewing, an app with all the key features could be a tipping point when making your decision. Reviews: Last but not least are reviews. The system’s website likely won’t point out issues or potential negative selling points of their product. If a system has been out for some time, it should have received some reviews. Luckily, we looked at each auto brewer on the market and are on a mission to review every single one to make your decision easy. Our preferred machines are listed at the top of this page, however, we also recommend seeing what other homebrewers say about brewing on them in addition to reading through short ratings on Amazon. Filling in what you’re looking for regarding the features listed above may point to the best system for you. It can be confusing to look at several products and try to discern what one is really ideal, but comparing the features with your wants usually helps weed out several options. And remember, if you have any questions about automated brewing systems, don’t hesitate to reach out.